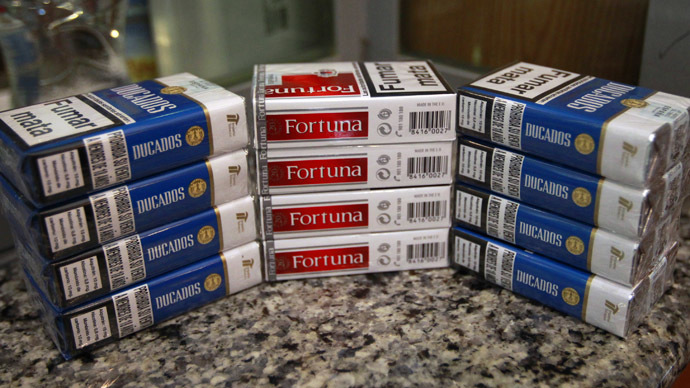 In what is being dubbed the “biggest civil case in Canadian history,” a Quebec court has ordered major tobacco companies Imperial Tobacco, Rothmans Benson & Hedges and JTI-MacDonald to pay $12 billion in punitive and moral damages to the plaintiffs. Though the legal proceedings began in 2012, it was back in 1998 when the two class-action lawsuits were initiated by about 1 million people in the Quebec region. During the years of trial, over 70 witnesses were heard and over 43,000 documents reviewed. "It's a big day for victims of tobacco, who have been waiting for about 17 years for this decision. It was a long process — but arrived at the destination and it's a big victory," said Mario Bujold, executive director of the Quebec Council on Tobacco and Health. The billions of dollars are to be distributed as compensation to about 100,000 smokers and ex-smokers in Quebec who alleged that these companies have failed to adequately warn consumers about the harmful effects of the product they were selling, despite knowing about this since the 1950s. According to the ruling, the plaintiffs with cancer who began smoking before January 1976 will get $80,000 each. Those who first started smoking after that date are entitled to $72,000. Those with emphysema will receive $24,000 in moral damages if they began smoking before Jan. 1, 1976, and $19,000 if they started smoking after that date. For the almost 1 million Quebec smokers who were unable to quit, the breakdown comes out to about $100 per person. "I am so relieved with what has happened," said Lise Blais, whose husband Jean-Yves Blais initiated one of the lawsuits. "Did you stop to think what a cigarette is? It destroys you — your health is totally destroyed," she said, holding up two photos of her late husband, who died in the summer of 2012 from lung cancer. The three tobacco companies all issued statements saying they disagree with the court’s ruling and that they would appeal. "We believe there are strong grounds for appeal and we will continue to defend our rights as a legal company." said Tamara Gitto, vice president, law, and general counsel at Imperial Tobacco Canada. "Today's judgment ignores the reality that both adult consumers and governments have known about the risks associated with smoking for decades, and seeks to relieve adult consumers of any responsibility for their actions," she added. Regardless of any appeals, the ruling ordered the companies to deposit at least $800 millionin trust with their attorneys within 60 days.